Copied with permission from Childhood Education, Summer 2010.
teacher, Hays CISD, Kyle, Texas. iss Mag, do we have to work in groups?” “Miss Mag, I can’t work with him.” “Miss Mag, can I work alone?” Dodgeball tactics—duck, dart, and flee—seemed to be the game plan in my classroom whenever I wanted my students to work in groups. “Just try to work together!” I would say again and again. As a new teacher, I was shocked to find that most of my students didn’t know how to work in a group. Week after week, I found myself spending more time talking about being team players and working together than I spent teachingmultiplication strategies and writing good leads. My soapbox was becoming old and worn, and I was overwhelmed and tired. Many teachers experience challenges when they place students in a group and expect them to cooperate. As Johnson and Johnson (1990) point out, “Simply placing students in groups and telling them to work together does not, in and of itself, produce cooperation” (p. 29). Trying to get students to work cooperatively was one of the most frustrating aspects of my first two years of teaching. The easy solution would have been to throw my hands up and say, “These kids just can’t work together!” I could have given in and assigned individual projects and allowed the students to work alone and be done with it. However, I was learning about cooperative learning structures (Kagan & Kagan, 2009) in a graduate mentoring and induction program for beginning teachers, and I wondered if these structures would work in my classroom. I focused my inquiry project on the following questions: 1) How does a structural approach to cooperative learning influence the social skills of 4th graders? 2) How do cooperative learning structures influence awareness of others’ feelings and encourage appropriate choices in social settings?, and 3) What influence do student reflections have on social interactions? Moreover, in many classrooms, the majority of interactions are teacher-student, which can create a competitive environment as students vie for the teacher’s approval. Cooperative learning helps balance this environment by encouraging students to work together to achieve learning goals. As Kagan and Kagan (2009) point out, “We live in an interdependent world in which, somewhat paradoxically, the ability to compete depends on the ability to cooperate” (p. 1.18). 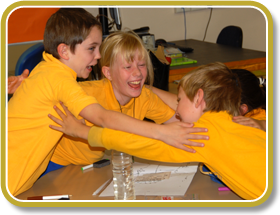 Several prominent researchers have developed various models of cooperative learning. For example, two brothers, David and Roger Johnson, created the Learning Together and Student Controversy models (Johnson, Johnson, & Holubec, 2002); Robert Slavin (1996) developed the Jigsaw II and Student Teams-Achievement Division models; and Spencer Kagan (1994) developed the Structural Approach to cooperative learning. Although different, these models each contain four defining elements of effective group interactions: 1) positive interdependence, 2) individual accountability, 3) equal participation, and 4) simultaneous interaction. Johnson, Johnson, and Holubec (2002) include a fifth element—group processing. Numerous practitioner studies have examined the impact of cooperative learning on student achievement and social skills development. For example, Nesbit and Rogers (1997) describe the benefits of integrating cooperative learning with science, reading, and writing instruction. Using several of the different cooperative learning models, the authors found that each method was successful in helping students work together in science to solve problems while using the tools of reading and writing. They suggested, however, that teachers begin with the Kagan structural approach before attempting the more complicated models of cooperative learning. Similarly, Muth (1997) found that cooperative learning could be used effectively during mathematics instruction to increase student comprehension of word problems, as well as to help them develop problem-solving skills. In the article “Using Cooperative Learning To Improve Reading and Writing in Mathematical Problem Solving,” she provides examples of how to implement cooperative learning in the mathematics classroom. Based on her experiences, Muth concludes that cooperative learning can improve reading and writing, as well as interpersonal skills, during mathematics instruction, particularly when students are working on problem-solving strategies. Bromley and Modlo (1997) found that cooperative learning helped maximize student learning in language arts instruction. A descriptive study of four teachers who implemented the Kagan Structural Approach during reading and writing instruction demonstrated the following benefits: 1) higher level thinking, 2) better communication between students, and 3) positive social relations. More recently, Law (2008) conducted two separate experimental studies on the effects of cooperative learning on 2nd-graders’ motivation and comprehension of text. In the first study, students in cooperative learning groups (n = 160) were compared with their counterparts in traditional instruction groups (n = 107). The results showed a significant difference between the two groups, with more favorable perceptions of teachers’ instructional practices and better reading comprehension in the experimental groups than in the control groups. In the second study, 51 second-graders participated in the instructional intervention program (cooperative learning). The results showed that students’ positive cooperative behavior and attitudes were related to their motivation and reading comprehension. When students perceived that their peers were willing to help each other and were committed to the group, they tended to be more motivated and performed better in reading comprehension. Numerous school-based studies in various grade levels have investigated the effects of using the Kagan Structural Approach to cooperative learning (Cline, 2007; Dotson, 2001; Howard, 2006; Murie, 2004). Consistently, these studies have shown positive effects on student achievement, attitudes, and engagement. Cline, for example, investigated the effects of using Kagan cooperative learning structures in her 5th-grade classes. During the 16-week study, she implemented the structures (e.g., RallyCoach, RoundTable) during guided practice in one math class; in a comparison group, she used a more traditional method of instruction (e.g., students working alone). Data collected from pre- and posttests revealed that the experimental group outperformed the comparison group on all measures of math achievement. Several studies have focused on the role of the teacher in implementing cooperative learning (Ding, Li, Piccolo, & Kulm, 2007; Leonard & McElroy, 2000; Lotan, 2003; Siegel, 2005). These studies concluded that the teacher’s decisions about how group tasks are set up, as well as his or her interventions during the group processing, are crucial to the success of cooperative learning in the classroom. In summary, findings from numerous studies demonstrate the positive outcomes of using cooperative learning throughout the curriculum. These benefits include improved academic performance, as well as enhanced social skills development.